The Simple lesson plugin and meeting teacher needs. Those Moodler’s who’ve worked with the lesson module are probably aware of its limitations and also its complexity. The layout is not very amenable to change so that the built-in question pages are often poorly laid out, particularly if they are matching types. The questions themselves don’t come from the question bank but have to be duplicated if you want to use them inside a lesson. I’ve had clients for whom I’ve had to play around with the extra CSS in the themes area to get it looking better. The branching is very powerful but the complexity sometimes makes life difficult for those who don’t need that. With this in mind I set about designing a Simple lesson module for teachers who are time-poor and just looking for a simple book-style layout but with questions from the question bank. The beta version of this is now available for installation and testing at: https://github.com/richardjonesnz/moodle_mod_simplelesson and is also waiting for approval in the plugins database. The activity module has been designed for Moodle 3.5. The module does not support timing, inserting into the gradebook or access restrictions, for these needs the Lesson module is available. For summative activities, consider using the quiz. This module supports common question types (multiple choice with one or more options, matching questions, fill in the blanks and so on) but not all have been tested as yet. Backup and restore – that is it can be backed up and restored but there will be no questions. This is because of the way that question categories work – it is not possible to predict the id’s of questions in the new course category (as far as I know). Recent work by Tim Hunt and the crew at Open University (UK) may well resolve that issue for me by adding the ability for the designers of questions to add a unique index to each questions. It would still depend on importing the question bank separately though. The plugin is added as an activity in the normal way. You must give the Simple lesson a name and fill in the description fields as it forms the first page your users will see. The name is the link to the activity as it appears in the course. This can be different to the lesson name and will appear on the first page. The page index is optional and will show on the top right of every content page by default. This can be overriden by themes. If you wish to use questions from the Moodle question bank, select an initial category. If you want to take questions from different categories come back to this setting after you have added the questions you need from each one. Teachers always have unlimited attempts, but student attempts can be limited of you wish. There are currently a selected set of behaviours and this is an area for which feedback from teachers would be very useful. limited award of marks. Questions can have marks awarded independently of the mark in the question bank. Title and content must be filled in. Content may contain media, such as audio and video as well as images. The Page Management link allows you to move your pages around as well as edit and delete them. The auto-sequence link sets all the links in the order of pages you have set on this screen. That is, page one will have a next link to page 2, page 2 links next to 3 and previous to 1. This makes sequencing your pages very easy. 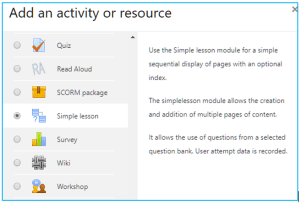 Question management works by selecting questions to add to the Simple lesson from the category you selected initially in settings. If you didn’t select a category, go back to settings and do that now. Once you have added questions from this category, you can go back to settings and select another to add questions from. The Question Management page will now show the questions that are available to add to your pages (only one question is permitted per page). Clicking the Page for question link allows you to add a question to a page. In preview mode the page contents can be viewed, but no questions will appear. Navigation is also possible using the index. When a student starts an attempt (assuming they haven’t exceeded the max attempts in settings) they will see the same pages plus any questions that have been added Depending on the type of feedback selected in settings they may have one or more chances to answer the question. If you want to make things less obvious, you could have the questions on different pages to the related content. For cases where you want to record a score in the gradebook, quiz would be the preferred option. The simpler types of question have been tested. The answers are given marks according to the type of question behaviour selected, the fractionally correct response and the mark allocated by the teacher when selecting the question. When the student finishes they see a review of their answers. If they didn’t answer a question it doesn’t appear in the review and the attempt is marked incomplete. They can also manage the attempts (to delete and allow a retry, for example). There is a course-wide report showing all attempts at all instances of Simple lesson in a course. Attempts management is available from the module’s settings cog (or activity settings in other themes). I am very keen to get the views of teachers while the module is still at the Beta stage of development. If you can install it and try it and comment below that would be very helpful. Wow – what great development ! Once you know what to do, and get your workflow organsised, it’s incredibly powerful and flexible. But this does mean there is a inherent level of sophistication, and many teachers struggle to use the Lesson unless they get some formal training to get them started. I like the simple approach here, and the fact that questions can be used from the question bank.